Flowers on a deigo tree bloom bright red at the eastern harbor of Taketomi Island, April 9, 2011. April 17, 2011. by Masatoshi Inafuku, staff writer of Ryukyu Shimpo. Taketomi Island – deigo tree flower viewing is at its best from early April on Taketomi, one of the Yaeyama Islands south-west of Okinawa. Deigo trees damaged by insects called Deigo-himekobachi, have been the cause of concern on the island since 2005. Residents responded by setting up an executive committee to ‘Save the Taketomi Deigo!’ (Yoshinori Uesedo, chairman of the Taketomi Community Center), carrying out a campaign to inject a special insecticide into the trees to eradicate the pests. The islanders worked hard for about six years to collect money and to treat the trees, most of which were saved and went on to bloom successfully. The locals are now thrilled to see the result of their labor – deigo flowers in full bloom. 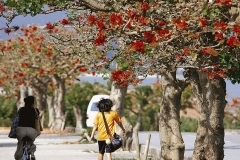 On April 9, a beautifully fine day, many visitors and residents took photographs beside the deigo trees lining the road leading down from the village toward the harbor. It was a truly beautiful scene with the bright red blooms of the flowers on the trees contrasting with the blue sky and view of Ishigaki Island off in the distance. Many of the deigo trees still having buds yet to open is likely that people will be able to enjoy the flowers in full bloom for the rest of this month. It cost two million yen to purchase the insecticide used to eradicate the deigo-himekobachi. The Prefectural Forest Resources Research Institute advised that the treatment was needed urgently so the Taketomi Community Center covered the initial outlay to purchase the drug and the Committee paid it back later with the proceeds from running fund-raising activities, including music festivals in conjunction with the local Taketomi residents’ organization. The islanders also volunteered their time to carry out the task of injecting the trees. “In the language of flowers, deigo represents a ‘dream.’ We realized our dream through Taketomi’s ‘Utsugumi’ (spirit of mutual support). We hope that we can help spread this spirit across the nation,” Uesedo said.